In the last five years the science of surf forecasting has come an awful long way. No longer is it enough to know that lows spin clockwise, highs counter-clockwise, and they're both reversed in the northern hemisphere. Of course, if you have no interest in DIY forecasting then you don't even need to know that much, you can simply read our wave graphs to find out what the surf will be like. Yet for those of us that never treat the weather as mere small talk the art of surf forecasting is a continual learning process. If you live in any of the southern states and read Swellnet's extended forecast notes you'll occasionally see the term 'Long Wave Trough' mentioned. The term often appears in relation to good swells so it's worth knowing what a Long Wave Trough (LWT) is and how it works. When learning about LWT's the first thing the lay surf forecaster has to understand is that all the world's weather patterns are controlled by the upper atmosphere. Chart 1 shows a snapshot of the upper atmosphere in the Southern Hemisphere on Thursday the 12th of May, with Australia located in the bottom lefthand corner. If you follow the undulating orange contours around the world, this is the upper level LWT that is often mentioned in our forecasting notes for the southern states. If you take a look you can see four pronounced areas of blue on the chart: one between Australia and New Zealand; another to the west of South America; a third to the east of South America; and a fourth to the south-east of South Africa. These are called nodes. This particular LWT has four nodes, yet LWT's can have more or less nodes than this. The number of nodes it has controls the speed of the LWT as it circulates eastward around the Southern Hemisphere. The speed increases when there are more nodes (4-5), and decreases when there are less (2-3). These upper level waves influence surface weather with cold fronts forming in the Southern Ocean following a very similar path to the contour lines shown. You can see that the LWT showed a peak between Australia and New Zealand on Thursday morning, with the node to the west of South America being even more pronounced. 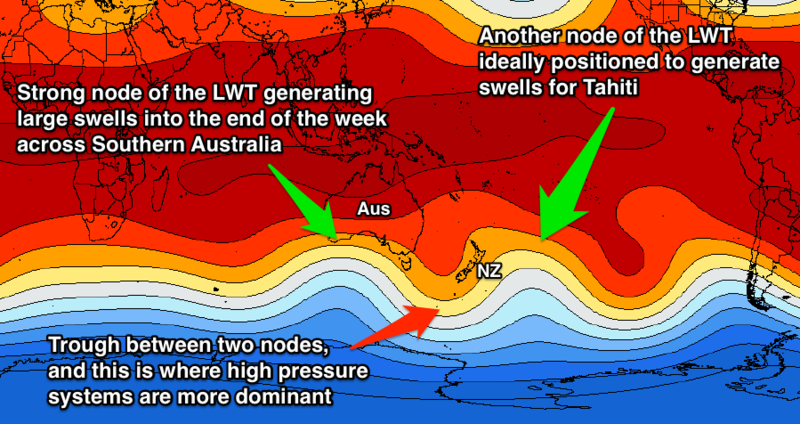 When one of the LWT nodes is positioned between Australia and New Zealand as shown in chart 2, any cold front forming in the Southern Ocean is steered up along the contours towards the southern Tasman Sea producing south-southwest swells for Victoria and Tasmania, with southerly swell energy impacting New South Wales. Much like pressure gradients at the surface, the tighter the contours on the chart, the stronger and more pronounced the LWT is in that area and the greater the likelihood of cold fronts strengthening as they push up from the Southern Ocean. Chart 3 shows a surface front pushing up from the Southern Ocean across the south-east corner of the country as a result of the positioning of the LWT. The recent cold weather experienced across the south-east of the country is associated with the LWT moving slowly east across Tasmania (chart 4). A succession of vigorous cold fronts have been projected up, one after the other, across the corner of the country providing plenty of swell for Victoria, Tasmania and New South Wales. This all came to a peak during the first half of last week with Victoria and Tasmania seeing large waves on Tuesday, with the New South Wales coast experiencing a strong episode of southerly groundswell on Wednesday. Fiji is also a big beneficiary when the LWT is parked across the Tasman Sea, with swells hitting 2-3 days after they impact New South Wales. This was the case last Friday, with Cloudbreak and other surrounding reefs seeing huge surf. Nice article Craig and very well written and presented in easy to understand terms!! points were already on today, but maybe everyones holding out for the weekend, as I had 3 hours with only 3 others out. Just an update on the position of the Long Wave Trough later this week/weekend. The Long Wave Trough is forecast to move across the South-eastern corner of the country and then the entrance to the Southern Tasman Sea during the end of this week while intensifying. This intensification should supercharge and steer a series of polar fronts up from the Southern Ocean and into Tasmania and then through the Tasman Sea from Friday into the weekend. Medium-large swells are expected for Victoria, Tasmania and exposed south facing locations on the NSW coast as well as generating a large swell episode for Fiji next week. The swell's generated by this intensification of the LWT probably won't be as big as when this article was created but it will be a much welcomed increase in swell activity across the NSW coast, that's for sure! Here's a short vid I made Craig after your original article & "that" swell. Nice work shoredump, love the name of the clip! Is that Jug going over the falls? I'm pretty sure we had a still shot of that that we ran as Wave Of The Day? Yeah that's Jug. He got a stack of good ones as well but unfortunately missed em. Too busy frothing I think. How is the LWT position looking for Indo a couple weks hence? Is it behind the good run of last week/this week? Hi Gibbsy, yes the LWT was responsible for the recent run of swell in Indo as it was focussed through the Southern Indian Ocean but is now moving across the south of Australia. We'll see another intense node of the LWT pushing through the Southern Indian Ocean over the weekend and this should produce another medium sized+ swell event for the second half of next week but heading into the following weekend and the week starting the 17th we'll probably see a small lull in activity. The next node may move through later next week, generating another medium sized swell episode for the second half of the week starting the 17th but this is a long way down the track. The LWT doesn't guarantee large swells but if it's quite pronounced and also stalling over a certain area of the globe the likely hood of above average swell activity is greatly increased. 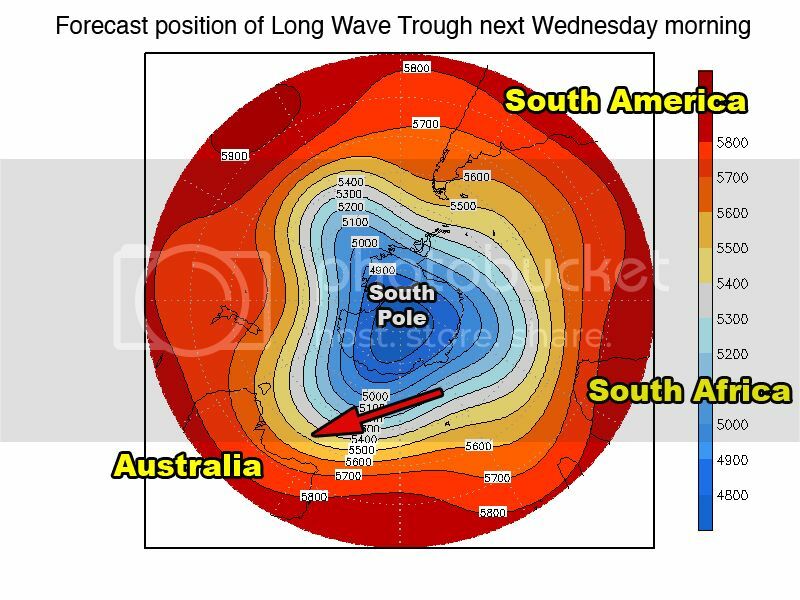 Southern Australia is set to receive back to back to back swells during next week, owing to the intensification of the Long Wave Trough (LWT) across the country next week. The below image link shows the position of the LWT next Wednesday and you can clearly see that the upper atmospheric storm track (contours) is aimed right into us. Southern Ocean storms should follow the contour lines shown on the chart, aiming a series of vigorous cold fronts up towards Australia. The interesting thing about next week is that the LWT will stall in our region through the entire week, with a couple of amplifications during this time, sending continuous storm and swell activity into the southern states. The Surf Coast should provide the best waves through this period with winds holding form the north-western quadrant throughout most of the swell episode. Keep an eye on local forecasts over the coming days for updates. meanwhile surface models don't know what to do with the above info . its changed 3 times in the last 2 days . latest suggests that although strong it will be held at bay by a strong surface high . which suggests that BIGGER meals maybe on the plate at more SW facing coasts . eagerly awaiting , have a WA mate in town that might need to be shown around next Friday /Sat . Fingers crossed for a decent drop of rain out of these coming systems, the land is desperate for a drenching. Never seen it so dry, any long range weather gurus wish to take a punt on here?? Any theory's or predictions welcome. Missed this sorry pharmer, how did you go yesterday? Adelaide got a good drenching so I hope you got a bit. Should be a bit more rain over the coming week and pumping swell to boot!! The Japanese group JAMSTEC currently haav a forecast for a Negative IOD Indian Ocean Dipole ( wetter forecast for SE Aust ) over the winter months . And if anything they have said that it would be Neutral ( average in the start of winter grading up to Negative in Late Spring [wetter] . Of course I'm not certain on what type of systems deliver for your specific property , as each are different . But the IOD has a very good correlation with the Wheat districts of NW Vic . And perhaps riverland SA . The Negative IOD tends to load up Pre Frontal systems with more available moisture in the form of NW cloud bands that produce decent rain leading the Fronts . Anyway Jamstec are probably the best forecasters , but its far from a 100% correct science . Another tell tale with about 60-70 % accuracy is if a Cyclone/Typhoon forms in the Bay of Bengal in the next few months , then there's a fair chance of a Positive IOD ( dryer winter ). Had a very nice opening rain with over 25mm of rain I the gauge!! Perfect!! Full bore on the tractor and am on the nightshift so I knock off at sunrise so looks like I will score a few nice waves after work each morning!! Thanks for your input Southey, that all sounds pretty good. That rain appears to have set me up for the perfect start to the grain growing season and should provide me with some green feed for the sheep around the same time as I run out of hay and feed grain. Gotta love life on the peninsula. Surf forecast looks great to though it appears to a more winter style wind pattern which isn't ideal for my preferred reef break, but I'm not complaining!! Whoo hoo!! What a great article Craig about the LWT systems, awesome reading and interesting. What are the numbers on the right hand side of chart 1, are they altitude in meters for the upper atmosphere or similar. Anyways its good to get tech answers revolving around the weather, as a weather looker myself, chasing snow and waves for 30 years, this is awesome. Nice to have you on the site wellymon. 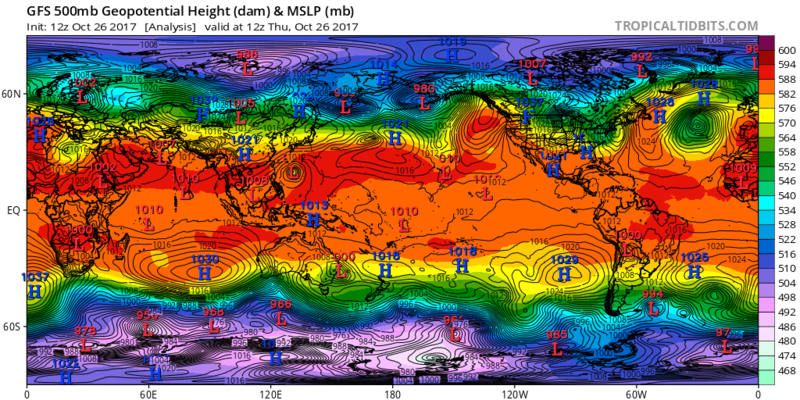 The Long Wave Trough charts are show Geopotential Height, which is the approximate height of the 500mb pressure surface above mean sea-level. Thanks and welcome Wellymon. There are a lot more articles like this around the site which you should also enjoy! is there any effect the LWT has on stalling the eastward movement of highs in the Western Pacific? Ie: for ideal cyclogenesis conditions? If a node (peak) of the LWT stalls at a particular spot, either side of it are troughs and here is where you'll generally see highs develop. Where the node (peak) stalls, fronts will be focussed one after the other into that region, and concurrently you'll see stalling blocking highs setting up camp adjacent. If the LWT is quite mobile though - rotating quickly - around the Southern Hemisphere you won't see blocking highs setup and stalling in a region, more so just highs moving steadily from west to east across an area. Currently we have a strong node of the LWT pushing slowly across the Bight, hence all the increased storm and swell activity..
Yocal, notice the trough in the LWT just to the east in the Tasman Sea, this is where high pressure systems are more dominant. If we saw this trough in the LWT stall across the Tasman Sea we could expect blocking highs to sit in the Tasman Sea for just as long. Answering your question about cyclones. The best setup is if we have a trough of the LWT stalling across the Tasman Sea or New Zealand, along with an active phase of the MJO. This would be favourable for a building easterly trade-swell from the interaction between the monsoon trough in the tropics and stationary highs to the south producing a broad easterly ridge. Chuck in a deepening tropical cyclone drifting south into the established trade-flow and Bob's your uncle. Awesome info cheers Craig. where do you get that LWT graph? We're producing them in house, hopefully on the site soon. Ah really Camel? It's freely available even if you're not a member or logged in. Was that the right way to word that computer jargon tech, anyone....! Apologies for the old thread revival, but is the below the EC equivalent of the GFS LWT plots? Yep, that's the one! Good find. Great thanks Craig. Is there any way of predicting (obviously not gonna hold ya to the accuracy etc) or guesstimating the travel times of a specific node. For example if you go to the very last EC LWT plot date (12z 29 April) above for the Southern Hemisphere you'll see there's a very pronounced node of the LWT in the mid Southern Indian Ocean (80E). Any way of guesstimating when this may push out into Aus East Coast swell window? Interesting Don, watching that same EC LWT (graph you posted above) up until Sat 02, it spikes then goes flat, spikes a little .......? They elude me these things for sure. Pretty much. Although our LWT charts are filtered 500-hPa (a little cleaner than straight 500-hPa geopotential heights). Are your LWT plots available yet Ben? They're being produced in the backend (4 times daily!) but we haven't worked out a way to show them in the front end yet (as our 4x panel already has four charts). My initial goal was to make each box selectable, so that you can choose whatever you want, and whatever region you want. So, you might have Winds (wide swell window), Winds (local), Tsig and Hsig, all at once. One of these options would then be 5WAV (filtetered LWT charts). We're adding a few other charts in the future too, and also looking to offer a different viewing platform (all in development though). But there's a million things in the dev backlog so I don't have an ETA unfortunately. Just post it in here then SD ?!?? I presume you are talking about the LWT influence on this ECL or more to the point the other way around . But I think this is different to the other things you have spoken about in the Indian . The upper trough seeding this ECL gets drawn down and retrograded by the next nodal pulse of of the LWT , the resultant shift sees a new LLCC form and then some form of low interaction until, the old and the new reform further Sth than the initial . No, SD is saying that tropical depressions help disrupt an upper level block and then once absorbed into the westerly storm track, help the next node of the LWY move in, faster than it would otherwise with out the tropical activity. I'm having a look into this, but I'm pretty sure a surface feature even as strong as a tropical cyclone can't really influence the upper levels so much as to speed the movement on the LWT. It's the other way around I'm pretty sure. yeah right . that old chesnut . Depending on Sheer / steering influences i would have thought the exhaust and resulting upper high pressure adjacent to the tropical system would repell the LWT . Although i have seen alot of what he's talking about ( in way of Ex TC's ) invigorating the westerly storm track but usually not an existing LWT amplified surface feature . From my observations its more so the ex tropical feature joins a more benign front / troughing arrangement . Firstly most fetch activity is thrown south , but then this sytem may stall and the stronger fetch rotates on a very braodscale axis or even a double headed elongated low , form which then the LWT may amplify it as the Strongest fetch reaches the back side of teh low and then produces good SW swell . Note that a Stronger surface High needs to be present at higher lattitudes " below " this to hold the broad scale mixing cut off from truly washing out into general storm track or more so the supporting uppers . These systems often wobble around on an uneven axis , much like a spinning top finally losing form with a centrifugal burnout . Sometimes this burn out or projection can push the system back up in a NE direction . In a bounce of sorts which can lead to a new SW captured fetch . Perhaps this consolidation is what SD is refering to as being of LWT driven , or where the LWT is ' sped ' up . I disagree there as i always see the LWT as more of a " lava lamp " than a rotating cog around the pole . The nodes do rotate , not always in the one direction , its more the amplification , northward expansion and most importantly a migration of the central pressure away from the True Sth pole position . This is what usually triggers for me an amplification in that quadrant is imminent . I'm sure this all ties in with the SAM , and GLAAM . I've spoken about this elsewhere , but i'm more of the opinion that there is another pattern much like the MJO which effects the LWT and is more tied in with Atmospheric tides . Yeah same, it's more a morphing as it slowly moves around the poles, faster when more nodes and slower when less, but always transforming as it does so. TC's do often get abosrbed into the westerly storm track and intensify polar fronts but not all the time, as we saw last week with Joalane. I spoke the mets at WZ about this theory and they agree with me. SD getting back to what i was purely looking at when i spoke of the MR forecast . Watch the nodes amplify ( expand out from the pole ) and also form into a very organised four nodal wave starting on around the 26 of April . These expansions or pulsing of the LWT is very cyclical especially around Autumn and Spring . 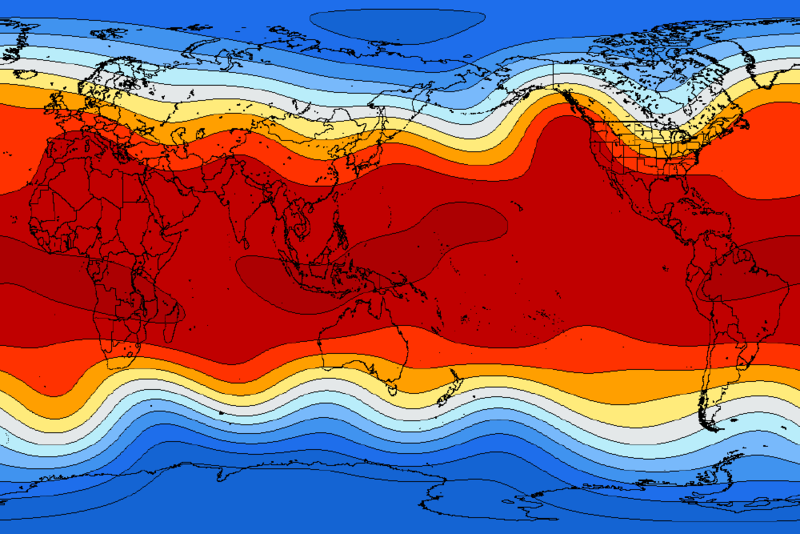 The last time on the 12 of April the dominant nodes were West Indian / Central East Pacific . This time around they have migrated a little more east . So yes there is a rotation , but the rotation i talk of is the rotating prevalence of each pulse expansion . Also to note is that the central point on both occasions has been in the Eastern Hem . Look into my eyes Sheepio. What you see is what you get, what you get is what you see. I do like your thinking about your theory champ, its healthy. With the time frames between the LWT nodes...??? "But the next test for this theory will be the 28/4/15..... All indicators look very good"
What is? You're going to have to explain exactly what your on about and not be so obtuse. You're not hinting that that weak cut-off low forming between South Africa and Australia is bringing in the next node of the LWT? What I see is the next node of the LWT moving in slowly from the west while strengthening from this evening through until it starts encroaching on WA late next week. Obtuse - "annoyingly insensitive or slow to understand"... "not quick or alert in perception"
Maybe not the right word, haha. PS I like this meaning better..
"(of an angle) more than 90° and less than 180°"
More than likely he was just being a-cute . Craigo, question. this may be semantics, but keen to see if you can set me straight. the use of the LWT in these forecasts still confuses me. 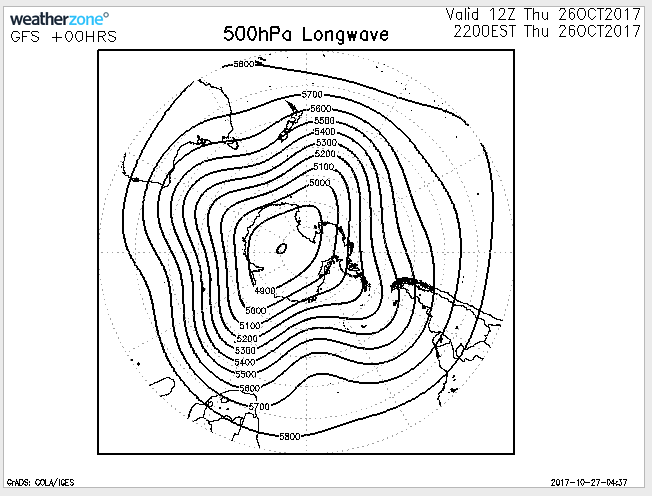 Refer to the WZ LWT chart and it measures the LWT as the 500hpa height (or 'thickness'). See chart below. But, thickness is a measure of, literally, the thickness of air UNDER the 500mb line. Obviously warmer air expands and is 'thicker' and cooler air is colder, denser and 'thinner'. So i read the LWT chart above as essentially just a smoothed MSLP chart of high and low surface pressures (temperatures). Essentially this LWT chart will be a smoothed version of lower atmosphere activity that GFS spits out each run for the next +192hrs no? So following that logic - the LWT is not steering the lower atmosphere systems, instead a stalled LWT in those charts, indicates we will have a series of surface storms and bringing with them low pressure/cold air over that area or node (i.e. 528/534/540 thicknesses at aussie latitudes & what shows up in these charts as a LWT node). Here is another chart with the same time stamp that is the same 'thickness' measure but also overlays the MSLP surface systems. In this case low MSLP = colder air = lower thickness @ 500mb = node in the LWT (match this to chart above). 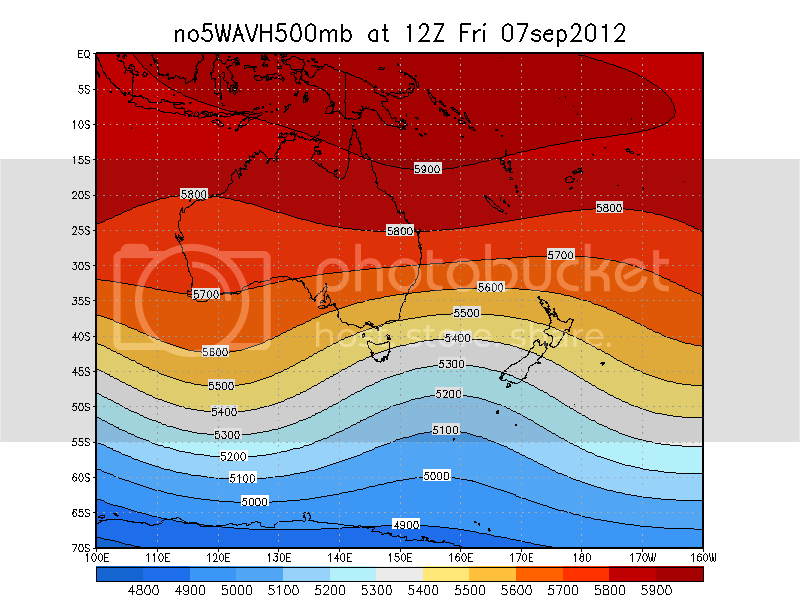 Lastly - here is a chart for the 500mb (circa 5500ASL) winds for the indian ocean at the same time stamp. This clearly follows the same shape as the LWT/thickness measures shown in chart above. Are the 500mb winds not the ones steering lower atmosphere systems? 1 - do you know why the LWT charts adopt atmospheric thickness as their measure - not 500mb winds? maybe it is as a proxy more easily extrapolated from the MSLP/850/700 charts? why not refer to as 500mb winds? 2 - in a forecasting sense, perhaps the real use of a LWT chart is in the long range (i.e if we see a stalled LWT - you can expect a string of fronts at se level to be embedded in it, so start booking those flights to indo before we get the specifics?). 3 - Can we get LWT charts that blend the major global models (EC/GFS/CMC etc?) - that would be cool to look at certainty of cold outbreaks in the 180hr + range? Great questions and I'll try answer as best I can. 1) Our LWT charts are the filtered 500hPa product, and if you compare the plain 500mb wind chart below here with our LWT chart for the same time-step you can see that the nodes and shape are much more distinguishable with the filtered version. If you find it easier to use the 500mb winds though, that's good as well. 2) Yes, correct, if you see a stalled and strong node of the LWT in the long-range charts then you can count on increased frontal and storm activity. So you won't get the specifics but you'll know there's swell for that period. 3) That's what we want to aim for down the line, overlays of charts to identify differences or agreements in the different global model forecasts. So the 500hpa winds are the actual 'drivers' of the increased frontal activity right? The LWT charts are just a simple tool to track what it's doing. so it still seems strange that chart we use is based on smoothed 500mb thickness, not 500mb smoothed winds? it seems to me that the vagaries in the 500hpa winds (strength/breadth/location etc.) would potentially have a lot of information (for forecasting) in it that is lost by simply looking at thickness/LWT charts based on smoothed lower atmospheric pressures/temperatures? 1 - what does filtered mean (filtered to 3-5 nodes or something)? So, why not just use the 500mb wind charts? & also - can you get them anywhere on a global level? 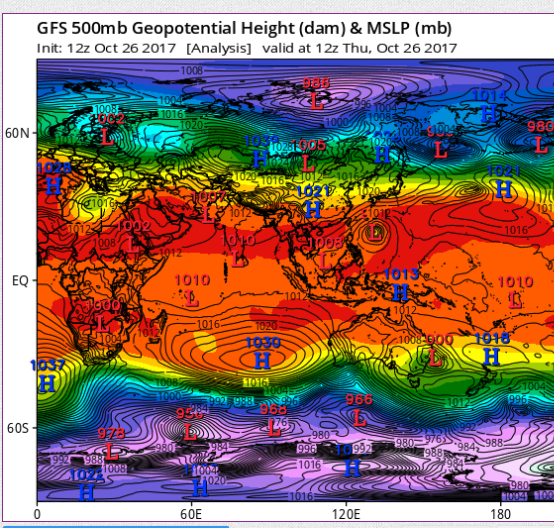 Windy (https://www.windy.com/?500h,-54.162,-69.961,3) will give me EC and GFS 500mb forecast but can't see on a global perspective so easily like your LWT charts. obviously, uniformity organisation and strength of the jet would be what to look for (but check the cut-off scenario over South America - so haggard - compared to the setup across the Indian Ocean. Actually check the state of the 500mb winds around Patagonia over the whole forecast period - pretty broken up.. maybe interference from the Andes? Sorry pushed for time to repsond fully, Ben will over the weekend. But the one problem you're running into is thinking the 500mb charts are smoothed versions of the lower surface systems. This is incorrect. They are totally different and the upper atmosphere weather is much broader, slower moving, while the surface features are more 'localised' and being steered by the upper pattern. The highly anticipated swell was big, wild, and contestable.